Clear View II Front Wiper Parking Area defrosters melt snow and ice low along the bottom of the front windshield to limit snow build up and stop wiper freezing even in the toughest weather. Developed and tested in Colorado’s tough winter conditions these new defrosters work with the vehicles existing hot air defroster to stop wiper freezing, improve wiper operation and enhance the view of the road ahead. Clear View Front Wiper Area Defrosters safely defrost the area at the bottom of the front windshield in the wiper parking area. Now with high density (HD) heating element spacing for better defrosting. Available for single and two piece windshields. Clear View II Front Wiper Parking Area Defrosters provide enhanced defroster performance along the bottom of the windshield in the wiper parking area. Enhanced wiper area heating complements the existing hot air defroster effectively eliminating wiper freezing and reducing snow build-up even in the most challenging winter conditions. Front Wiper Parking Area Defrosters are now available for full and split glass windshields. Edge defrosting in the wiper push area are also now available. The vehicles hot air defroster clears the area directly in the drivers line of sight about mid way up the windshield in line with the drivers line of sight. Clear View Front Wiper Area Defrosters put a measured safe heat low on the front windshield below where normal hot air defrosters warm the glass. The defroster elements are sandwiched between two pieces of release paper that when separated allow perfect alignment on the glass. Defrosting is accomplished through contact between the Clear View defroster elements and the window. The defroster is connected electrically through the buss bar tabs and activated with the automatic ThermaSync defroster control and switch. 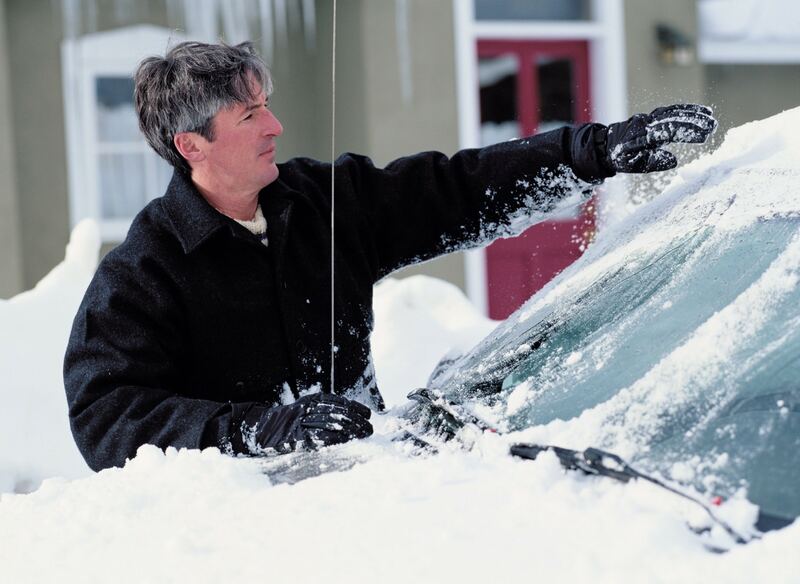 In tough winter conditions wipers can push snow into areas at the sides of the windshield. This snow build up can limit wiper movement and interfere with visibility. Clear View II Side Defrosters put the heat along the edge of the windshield melting snow and ice in this critical area. The heating elements come on pre-spaced rolls which are trimmed for a custom fit when installed. The self-adhesive heating elements bond directly to the glass and connect to the defrosters side buss bars. A cover is then applied to the buss bars for a finished factory appearance. The side buss bars include integral tabs are positioned for easy connection to the ThermaSync® defroster control. A cover is applied to the buss bars for a finished factory appearance. Heating elements match the brownish color of factory defrosters and adhere directly to the glass for improved visibility and safe winter driving. No backing is left on the window to fade, crack or yellow over time. The automatic shut off is set to 20 minutes as standard. For different timer options please call in your order. 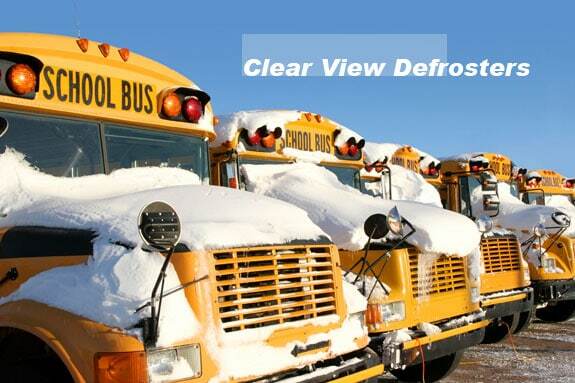 Clear View Bus Wiper Parking Area Defrosters include eight heating elements measuring 6 3/8 (16) inches in height. Minimum length is 68 inches, maximum 84. Connection tabs are both on the same side fro easy wiring. 12 Volts. Twenty minute automatic shut off. Installation ready. What’s Included : Bus Front Wiper Parking Area Defroster, single piece windshield. Includes 2812 ThermaSync control, switch, wire harness and installation pack. Does not include Switch Boss. Clear View Bus Wiper Parking Area Defrosters include eight heating elements measuring 6 3/8 (16) inches in height. These are designed for two piece windshields. Minimum length for one side is 34 inches with a maximum of 50. Connection tabs are both on the same side for easy wiring. 12 Volts. Twenty minute automatic shut off. Installation ready. What’s Included : Bus Front Wiper Parking Area Defroster, two piece windshield. Delivered complete ready to install including defroster, 2812 ThermaSync control, switch, wire harness and installation pack. Does not include Switch Boss. Clear View defrosters use 2812 ThermaSync controls which provide several options including operation of multiple defrosters with a single switch plus a range of automatic timing options from ten minutes to continuous operation. ThermaSync 2812/2824 and the Switch Boss which allows several defrosters to operate from a single switch. Delivered ready to install, Clear View Front Wiper Defrosters are complete with ThermaSync defroster control and switch plus an installation pack including wiring harness, under dash mount, fuse and holder, mounting screws, connectors and and other installation accessories plus fully illustrated instructions. The Switch Boss allows two or more defrosters to be operated from a single switch ideal installing multiple defrosters in a cab. For example the vertical wiper push defroster and the front wiper parking area defroster can be networked together for single switch operation. Up to four defrosters can be networked using Switch Boss. Requires 2812/2824 TheramSync controls.